April flew by in a whirlwind of jewelry making techniques, free bead jewelry patterns, and new inspiration for making jewelry at home! Did you miss any of it? Well not to worry! We're recapping all the best free jewelry designs right here for your beading convenience! Making jewelry at home is a breeze with instructions like these. Whether you want to learn new techniques or you just want to hone your old skills, we've got free bead jewelry patterns to make it happen! These free jewelry designs were the top 10 most popular tutorials among our readers this month, so if you're in the mood for making beaded jewelry and want to see what's hot right now, these free bead jewelry patterns seem like the perfect place to start! When it comes to making jewelry at home, our readers are all about variety! The jewelry making techniques in this collection range from stitching to stringing, and even glass bead making! Your favorite free bead jewelry patterns included everything from wrap bracelets to charm necklaces to woven rings. One thing's for sure, making beaded jewelry will never be boring with variety like this. But even among all that variety, there were some common threads. Many of your favorite free jewelry designs this month were for bright, fun, and colorful projects. And, as always, several quick and easy necklaces were among the favorite free jewelry designs. Who doesn't love a simple accessory you can make and wear instantly? For more insight on this month's most popular jewelry making trends, check out all of the tutorials below! 2. Quick Zipper Loop Earrings - Making jewelry at home doesn't have to be expensive OR time consuming! Whip up these easy dangle earrings in a flash, maybe from supplies you already have lying around! If you love free jewelry designs that are minimum effort and maximum impact, this is the project for you. 3. Mix and Match Necklace - Free bead jewelry patterns that upcycle old jewelry are some of our favorites, like this eclectic necklace! If you like making beaded jewelry from materials you already have at home, you'll love these free jewelry making instructions. 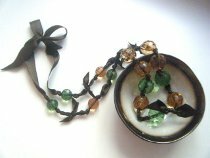 Combine old broken necklaces and spare parts into a brand new creation! 4. Sugar and Spice Necklace - Weaving ribbon into chain is one of the simplest jewelry making techniques, but really has a stunning effect! This basic necklace tutorial does just that. If you like free jewelry designs that blend hard and soft elements, you'll love this project. 5. Modern Pearl Necklace and Earring Set - Some free bead jewelry patterns never go out of style, like this pearl jewelry set! Every woman should have a classic pearl necklace in her collection, and by making jewelry at home, you can have your own pearl necklace for less. Making beaded jewelry is the best solution to looking sophisticated on a budget! 6. Woven Seed Bead Rings - Looking for free bead jewelry patterns you can whip up in a flash? These cute and simple woven rings are a great project if you want something quick and fun. Plus, if you need beaded jewelry patterns to help diminish your overflowing bead stash, this is a great solution. 7. Charm-ing Necklace - We love jewelry making techniques that use unexpected materials, and this tutorial is for making beaded jewelry from metal scrapbook embellishments. Free jewelry designs like this one are great inspiration for making jewelry at home because they teach you that jewelry can be made from anything! 8. Chain and Seed Bead Summer Necklace - This is another of our free bead jewelry patterns that is a great stashbuster. You probably have an endless supply of seed beads, right? Well making beaded jewelry is the only way to use them up! 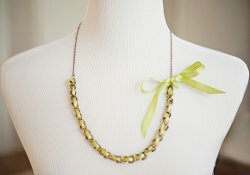 This multistrand necklace is a cheerful summer accessory that will surely become a wardrobe staple. Plus, simple stringing is one of those jewelry making techniques that is almost therapeutic. 9. Cute and Easy Necklace - Who says making beaded jewelry has to be complicated? Some of our most popular free bead jewelry patterns are the simplest ones of all, like this oh-so-easy necklace. All you need are some chunky beads and some ribbon for this project. 10. 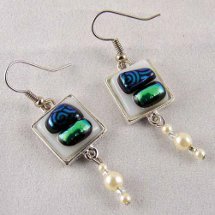 Bedazzled Glass Earrings from Diamond Tech - Glass bead making is potentially one of the more complicated jewelry making techniques, but the results make it all worthwhile! If you're really serious about making beaded jewelry, you have to check out this tutorial. It's a bit more involved and time-consuming, but the end product is so gorgeous. This project takes making jewelry at home to a whole new level! This is great, I wasn't aware of this site in 2012, so I missed a lot of these wonderful projects. This gives me a chance to catch up. Just flipping thru I see a few that I want to start on right now. Thank goodness you have a save option.